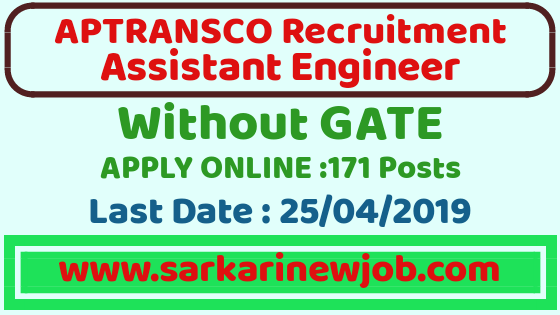 APTRANSCO Assistant Executive Engineer Recruitment 2019| 171 Post| Last Date:25/04/2019| Without GATE - Sarkarinewjob.com A ultimate job portal to provide employment news. APTRANSCO Assistant Executive Engineer Recruitment 2019: Transmission Corporation of Andhra Pradesh has published a recruitment notification for the post of Assistant Executive Engineer. As per the Advertisement, there are a total of 171 Vacancy for the post of Assistant Executive Engineer (Electrical). This recruitment is without GATE examination. So now its a great opportunity for the students who are looking for a government job without GATE 2019.Applications are invited On-line through APTRANSCO WEBSITE www.aptransco.gov.in and http://aptransco.cgg.gov.in from 26.03.2019 to 25.04.2019(to 24.04.2019 for payment of fees) from eligible Engineering Graduates for filling up the following vacancies on regular basis in APTRANSCO Engineering Service. Educational Qualification:BE/B.Tech/A.M.I.E in Electrical & Electronics Engineering or equivalent qualification in the similar discipline from any recognized University in India on regular basis as on 01.02.2019. Application Fee:Each applicant must pay Rs.150/- (Rupees one Hundred and fifty only) towards Application Processing Fee. i) Applicants under General category must also pay RS.350/- (Rupees three Hundred and fifty only) towards Examination Fee. (Applicants belonging to SC/ST/BC Communities and PH need not pay this fee). ii) Candidates belonging to States other than Andhra Pradesh will be considered in general category only and are required to pay the aboveprescribed fee. Age Limit: Maximum Age limit for APTRANSCO Assistant Executive Engineer (Electrical) is 42 years as on 01.02.2019. Upper age limit relaxation for SC/ST/BC candidates is 5 years and for PH Candidate is 10 Years. Note - Candidates can download the syllabus for APTRANSCO Assistant Executive Engineer (Electrical) by following the links given in Important links section. i) The selection of candidates for appointment will be made 100% on Written examination. ii) Only those candidates who qualify in the written examination by being ranked high, community wise will be called for verification of Original Certificates in 1:1 ratio.